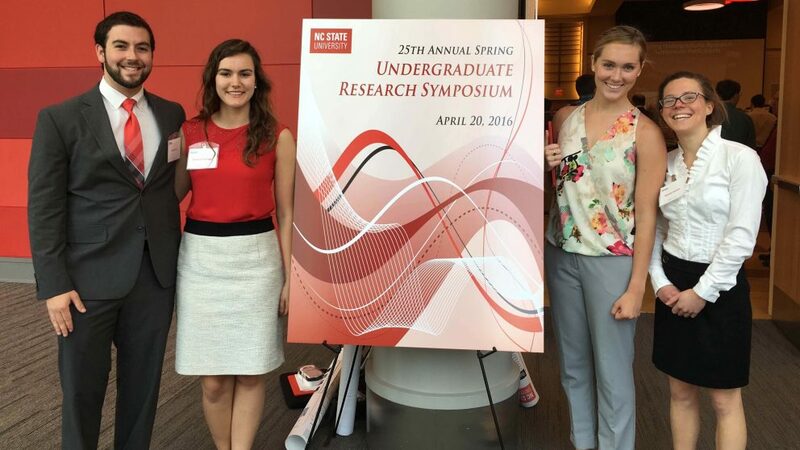 The 25th Annual NC State Spring Undergraduate Research Symposium was held from 10:30 a.m.-2 p.m. Wednesday, April 20, in Talley Student Center Ballroom. 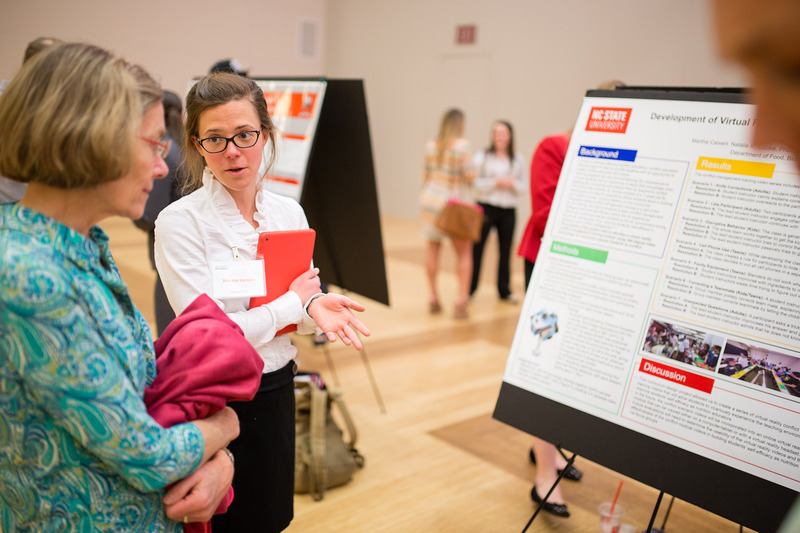 Students, faculty, staff and the general public were invited to drop in and inquire about the various undergraduate research projects students have been working on the past semester or academic year. 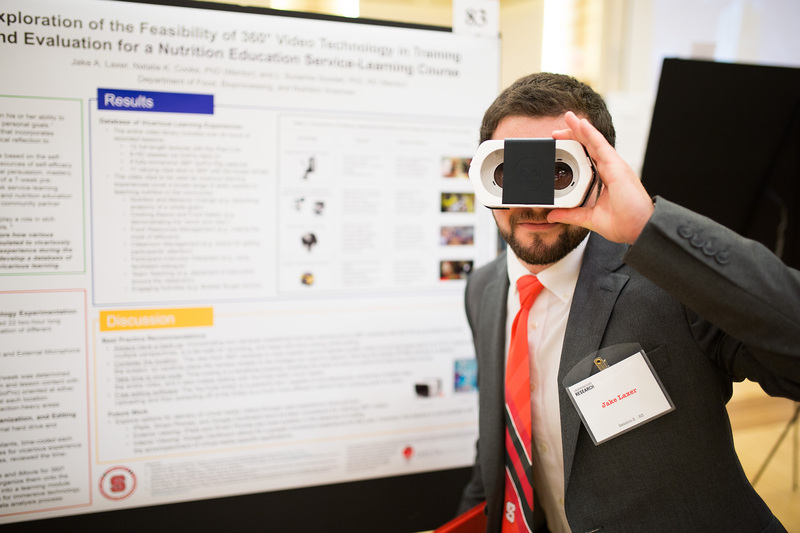 The symposium featured 432 student presenters covering content in fields ranging from psychology and statistics to nuclear engineering and community nutrition. 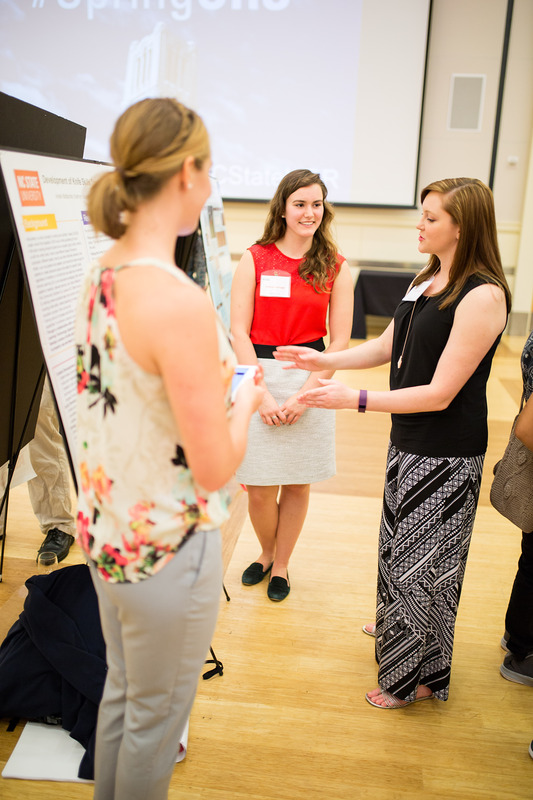 Three posters at the symposium highlighted scholarship of teaching and learning projects funded by a DELTA Exploratory Grant. Through this grant, students worked with Dr. Natalie Cooke, a postdoctoral teaching scholar and a program director for A PACKed Kitchen, and Dr. Suzie Goodell, associate professor, to develop a series of video-based training tools. 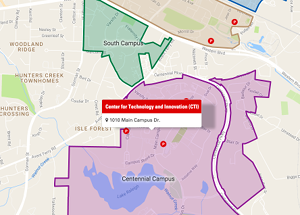 These videos will allow students in NC State’s NTR 420 Community Nutrition class to learn how to teach cooking and nutrition classes in the community. Yes, videos that teach students how to teach. Student presenters for this project were Martha Calvert, Jake Laxer, Arden Mattachini and Kati Scruggs. Martha Calvert describes the conflict management scenarios project to Animal Science Professor Dr. Joan Eisemann. Calvert’s research was geared toward conflict management during the students’ service-learning experience. The purpose of her project was to develop a virtual reality conflict management training module using 360° video technology to vicariously expose students to conflict prior to teaching the class themselves. Using feedback from informal focus groups with students, the researchers created a list of conflicts. Working with the DELTA production team, a set of specific conflicts was selected, creative briefs were developed and a series of conflict scenarios were produced. Student instructors and participants served as actors in the videos. DELTA team members filmed the modules using a 360° GoPro camera rig positioned above the lead instructor’s head or in line with the participants and assistant instructors. Placement of the camera was crucial because it provided either the first-person perspective as the lead student instructor or that of a teammate or observer. The videos cover seven scenarios, each specifically focused on adults, children or teens. Each scenario begins with a two-minute clip of class in which a conflict occurs followed by two or three resolutions of how student instructors might respond to the conflict. Future students will be able to observe these scenarios and discuss the impact of various resolutions on the lead instructor, teammates and the community participants. These scenarios will be incorporated into an online VR training module that can be viewed on a computer, tablet or with a head-mounted display like Google Cardboard. “The DELTA team is so knowledgeable about the latest filming technologies, and they helped bring all of the creative briefs to life! If it wasn’t for their expertise with 360° virtual reality videos, then our project wouldn’t have had such an immersive feeling for the viewer,” Calvert explained. Jake Laxer demos a virtual reality headset that could be used to create an immersive learning environment. Laxer laid out two goals for his project, one of which was to explore how various video technologies could be utilized and manipulated to vicariously expose students to the service-learning experience prior to the experience itself. His second goal was to develop a database of example videos to serve as a source of vicarious learning. The research team filmed 22 two-hour long Cooking Matters lessons using four different technologies. These technologies include Apple iPad 2 Air with a tripod, GoPro Hero 3+ camera with a tripod and external microphone, 360° video rigs, and a Kodak PixPro SP360 camera. Laxer determined the video clip database needs to cover a broad range of skills required to teach nutrition in the community. Some of these skills include nutrition and behavior change, cooking basics and food safety, food resources management, classroom management, participant-instructor interaction, team-teaching and engaging activities. His online database of 120 short video clips will be used to show future students examples of each of these teaching techniques. While Calvert and Laxer had their own primary focuses for the project, Mattachini and Scruggs worked as a pair, creating a series of knife skills training videos to prepare students to properly use and teach safe knife techniques. In order to do this, the pair determined which common knife skills were needed to prepare a variety of fruits and vegetables and they created a list of skills-based topics. They wrote scripts for the videos and annotated them with live action shots. DELTA filmed recording sessions using two video cameras with an additional camera for still photographs. Mattachini and Scruggs recorded instructional voiceovers the DELTA team synched with the videos based on the original scripts. “Working with the DELTA team has been a privilege, and watching our ideas and hard work come to life in the videos was extremely exciting,” Mattachini stated. From left to right: Arden Mattachini and Kati Scruggs discuss the importance of knife safety with poster visitor. Although the team was divided into different concentrations, Laxer claims this dynamic did not hold the group back in any way. “Working with a team synergistically and working toward the same goal yet within very specific concentrations was awesome. We worked separately but could still encourage each other. It was tedious, but working together and collaborating made it a great experience,” Laxer said. Cooke and Goodell, who have mentored undergraduate research assistants for several years, were excited at the prospect of including undergraduate research assistants on this DELTA grant because it meant that their students would be able to benefit from the mentorship of members of the DELTA team as well, learn about state-of-the-art technologies and educational pedagogies. The DELTA team working on the exploratory grant include Lead Instructional Designer Cathi Dunnagan, Creative Director of New Media Development Mike Cuales, MultiMedia Specialist Thomas Crocker, Project Coordinator Laurie Gyalog and Assistant Director of Project Coordination Merranie Zellweger.